Ken Ogata, Masayuki Shionoya, Hiroshi Mikami, Junya Fukuda, Shigeto Tachihara, Junkichi Orimoto, Eimei Exumi, Minoru Hodaka, Go Riju Mishima, Yuki Nagahara, Kyuzo Kobayashi, Haruko Kato, Kimiko Ito, Hideo Fukuhara, Yosuke Mizuno, Alan Mark Poul, Ren Ebata, Yasuhiro Arai, Fumio Mizushima, Yuichi Saito, Bando Mizoguchi, Hisako Manda, Naomi OkiMiki, Imari Tauji, Koichi Sato, Shinji Miura, Sawada Osamu, Reisen Lee, Setsuko Karasuma, Tadanori Yokoo, Yasuaki Kurata, Mitsuru Hirata, Sachiko Akagi, Sachiko Hidari, Tsutomu Harada, Mami Okamoto, Nagashima, Hiroshi Katsuno, Hiroki Ida, Jun Negami, Ryo Ikebe, Shoichiro Sakata, Naoya Makoto, Kojiro Oka, Tatsuya Hiragaki, Shinichi Nosaka, Atsushi Takayama, Roy Scheider, Naoko Otani. In 25th November, 1970, Yukio Mishima, in the ritual act of Seppuku, knelt on a carpet and plunged a dagger into his abdomen. Mishima had sacrificed his own life, a gesture of defiance against the violation of his country’s dignity. Mishima designed his life as a drama; in his books he plotted out his life down to the last chapter. A twentieth century writer of the highest acclaim, Yukio Mishima generated more than 30 novels, in addition to numerous plays and movies. He was truly a renaissance man and was not only Japanese, but a world figure. Produced by two of the world’s greatest film-makers – George Lucas and Francis Ford Coppola and directed by Paul Schrader, Mishima is a haunting, lyrical story of a tortured modern man. 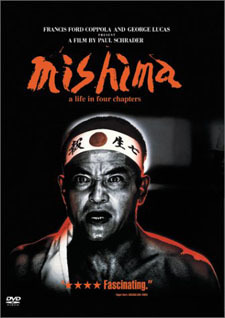 Mishima won a special award for Best Artistic Contribution at the Cannes Film Festival 1985. Producer: Mata Yamamoto, Tom Luddy. Screenwriter: Paul Schrader, Leonard Schrader. Conceived in collaboration with Jun Shiragi, literary executor of the Mishima estate. Editor: Michael Chandler, Tomoyo Oshima. Makeup: Yashuhiro Kawaguchi, Masayuki Okubi, Noriyo Ida.